The owners of Peterborough United are exploring building a new stadium to replace the existing ground in London Road. In a blog published on the club’s website co-owner Jason Neale said the ABAX Stadium is “showing her age” and there are “restraints” to developing it. But he insisted any new ground would be built within the city of Peterborough. Dr Neale has been leading the negotiations with Peterborough City Council to buy back the ABAX Stadium from the local authority. In October the two parties signed a Memorandum of Understanding (MOU) which committed them to trying to finalise a deal for the stadium and London Road grounds over the next six months. Dr Neale’s blog states that himself and fellow co-owners Darragh MacAnthony and Stewart ‘Randy’ Thompson want to own the ground separately from the club for two reasons. He wrote: “First, a separate corporate structure allows us access to a broader range of financing options, which would better support developing the level of facilities that our wonderful fan base deserves. The Posh Supporters Trust has a statutory right to bid for the ABAX Stadium and grounds in London Road as it is registered as an Asset of Community Value. Dr Neale confirmed that the covenant would remain in place should a new stadium be built. He added that it is “far too early in the process” to discuss specific locations should Posh move away from London Road. The current stadium has a capacity of 14,100. 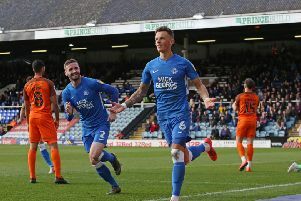 The council bought it and the surrounding land for £8 million from Peterborough United Holdings Limited (PUHL) in 2010, a deal which was widely welcomed as it secured Posh’s future. PUHL had previously bought the ground from Peter Boizot in 2003. But it caused plenty of anxiety for Posh chairman Darragh MacAnthony who revealed the rent was set at £500,000 a year with the club responsible for repairs and improvements despite being tenants. Dr Neale’s blog also reveals that the club is currently “in the midst of a planning and grant application phase to materially upgrade our academy”. Progress is also said to have been made on developing an incubator focussing on “sports science, digital arts, software and other technologies traditionally not found in the region, as well as an angel investment group to support this activity”. Business incubators specialise in speeding up the growth of start-up companies and guiding early-stage businesses on the road to commercial success. Angel investors are private investors who provide finance and support to early-stage businesses. A plan for the incubator is expected to be submitted to the council for review in the second half of this year. Dr Neale and Mr Thompson joined Posh as co-owners last March.